The Southern Live Oak (Quercus Virginiana) grows to 50 feet tall. It has a dense, wide spreading crown and small shiny leaves. 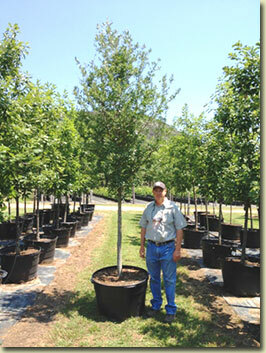 This tree is tough and tolerant of a variety of soils, which allow it to thrive in most of Texas' climates. It grows best on well-drained clay loams and gravelly clay loams and it does not tolerate poorly drained soils or extremely well-drained deep sand. The Southern Live Oak is an evergreen to semi-evergreen tree. Our tree farm specializes in offering grown trees in 45 gallon containers.